The spectacular beach at Half Moon Bay, Little Water Cay. A beautiful day at the Bight Beach, Providenciales. 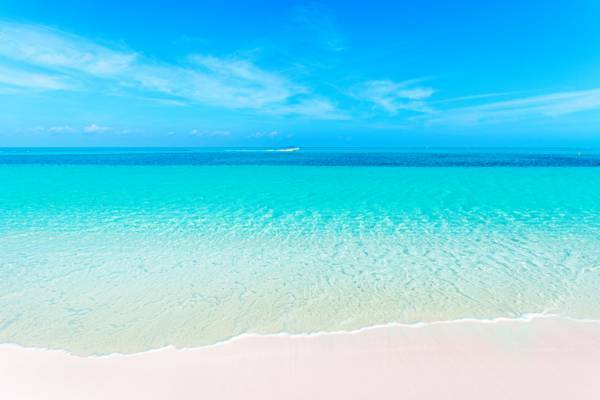 The Turks and Caicos is a relatively small country, and the distance between the western-most land ( West Caicos), and the eastern-most ( Martin Pinzon Cay) is less than 100 miles (160km), so the weather conditions are generally similar across our archipelago on any given day. The greatest difference in localised conditions are the later afternoon cloud cover and light rainfall that sometimes occurs over North Caicos, parts of Providenciales, and on Parrot Cay and Pine Cay. These conditions are created by the extensive marine wetlands that are found on the southern coasts of the central Caicos Islands. As the morning and mid-day sun heats the saline tundra, the surrounding hot air rises and condenses moisture in the atmosphere into rain. This localised rainfall tends to be brief in duration, with showers of under 10 minutes being the norm. What Does the Forecast Really Mean? When planning your vacation (and for the peace of mind! ), it’s important to understand how the weather forecast relates to actual conditions on our islands. As a small archipelago that’s exposed to the open Atlantic, the Turks and Caicos often experiences rapid changes in the weather. It may be disappointing to see a forecast for rain during your stay, but the truth is that showers are often brief and localized. In the case of the island of Providenciales, the typical projection for rain often coincides with a very short duration drizzle at either the eastern Leeward area, or at the remote wetlands at the west coast. Some weather forecast websites display a percentage for precipitation or rainfall. This is based off the chance of any rainfall for the given period of time. More often than not, low percentage numbers are experienced as barely noticeable rainfall. Likewise, an icon of rainy clouds is based off the same metric. Calm conditions at Sapodilla Bay Beach, Providenciales. Our different islands see a slight variance in rainfall patterns. 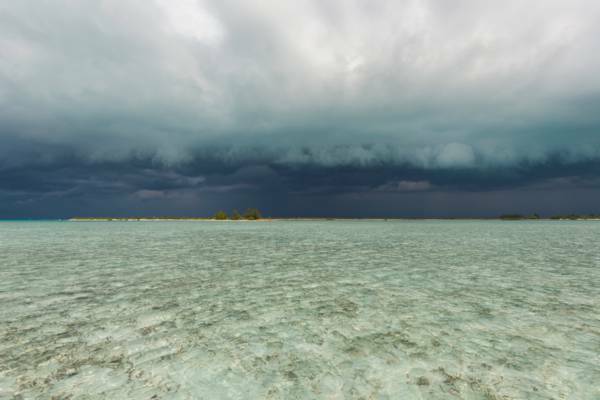 North Caicos, Middle Caicos, Parrot Cay and Pine Cay collect the most rain. Providenciales, South Caicos and East Caicos follow next, and due to their isolated location upwind on the far eastern side of the Turks and Caicos subterranean plateau, Grand Turk and Salt Cay see the least. Occasionally, (we’d estimate once every month or two), the country does experience a heavy rainfall that may last for a few hours, however, the majority of the annual rainfall is brought by one or two passing tropical cyclones during the summer Atlantic hurricane season. Unless the forecast shows heavy rainfall throughout the entire day, our advice is to not worry and enjoy your vacation. As our stunted and low-height vegetation can attest to, the Turks and Caicos receives some of the lowest rainfalls of any Caribbean nation. Generally, the water temperature at the beach will be higher than what predictions show due to localized heating by the sun. Our different coasts are affected to varying degrees. 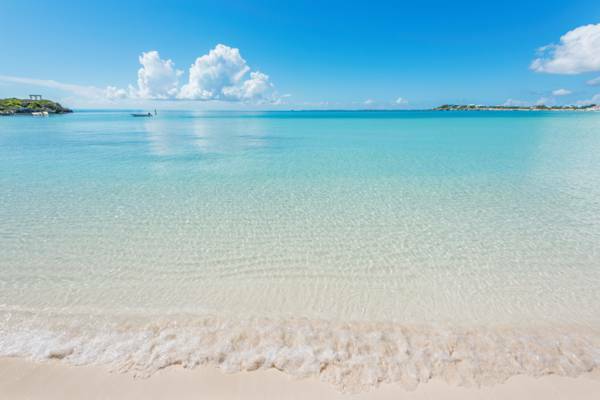 Areas that see limited water movement, such as Taylor Bay Beach and Sapodilla Bay Beach, will typically be much warmer than coasts that are either exposed to deep water or have natural tidal movement, such as Grace Bay and Malcolm's Road Beach. Those venturing farther from shore, such as scuba divers and snorkelers on a boat cruise, are more likely to experience cooler ocean water. Approaching storm over Water Cay. If you’re in the Turks and Caicos and the weather simply isn’t agreeing, consider taking a day trip to one of our outer islands where conditions may be better or visit on of our historical sights or natural attractions. Unless a serious storm is blowing, it’s typically possible to find a beach that’s sheltered. Generally, the coast on the opposite side of the island (the leeward side) from where the wind is coming from will have the smoothest conditions. For example, if the north coast beaches of Grace Bay Beach, Leeward Beach and the Bight Beach are rough, the south coasts of Long Bay Beach, Sapodilla Bay and Taylor Bay will often be calm.